Another weekend, another holiday to rediscover through French eyes. 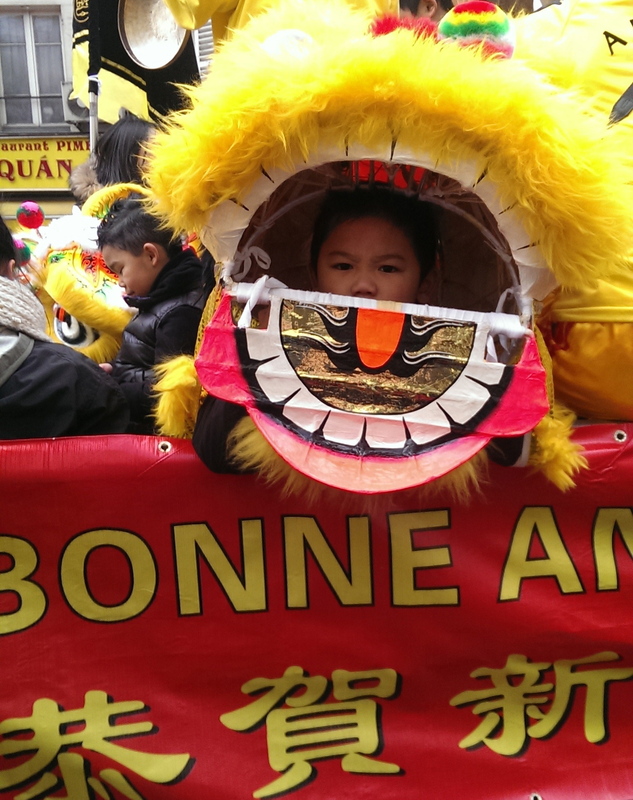 Today we enjoyed the spectacular sights, sounds, smells, and tastes of Chinese New Year in the thirteenth arrondissement. Unlike Burns night (the subject of my last post) I’ve celebrated Chinese New Year before. The reason behind this difference is easily identified: Chinese food. Unlike haggis, I consider Chinese food to be an essential aspect of my ethnic heritage, as a New York Jew. From dim sum brunches with my grandparents on Mott street, to lunches out with my mother who worked for the city government (conveniently located near Chinatown), to takeout deliveries any night of the week, I grew up on a steady diet of soy sauce, rice, and pork. 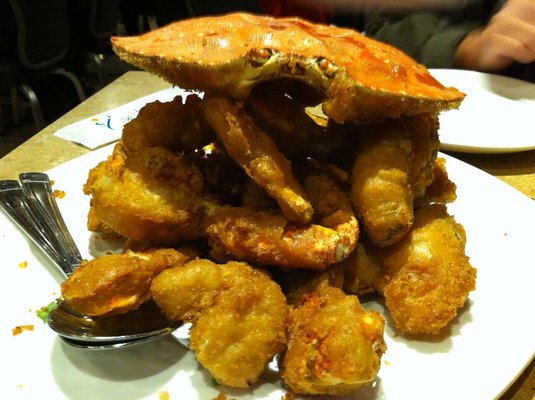 Graduate school at Berkeley gave me the opportunity to expand my horizons with salt and pepper dungeness crab at San Francisco’s R & G Lounge, sea food dim sum at Ton Kiang, steamed shrimp at the Pacific East mall in Richmond, almost walking distance from our apartment, and more dim sum in Oakland’s chinatown. Not to mention, my first real exposure to Vietnamese food, which in NYC had closely resembled Chinese food but with spring rolls. Now the blessings of Berkeley introduced me to pho and bahn mi. Yum! No surprise that rural northern Illinois, where we turned up next, had nothing comparable to offer. Grimly I abstained for four long years before moving back to the west coast, where surely excellent Asian food would re-enter my regular diet. But we were crestfallen to discover that Vancouver Island is no Vancouver in this respect. Victoria may have the oldest Chinatown in Canada, but it’s hardly the liveliest. 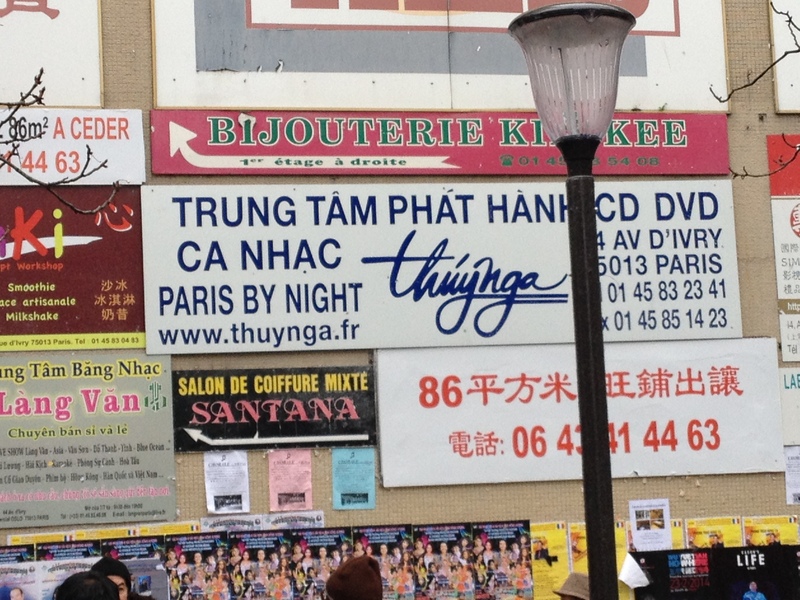 So it was with great pleasure that we discovered our Parisian apartment to be an easy walk to the 13th arrondissement, site of Paris’s largest Chinatown (slightly misnamed, since the quartier is mostly Vietnamese, I think). My son has inherited from his Jewish side a gluttonous appreciation for the cuisines of Asia, and even my picky daughter has an endless appetite for white rice. But the greatest joy for le rosbif and me has come from shopping in the markets on Avenue d’Ivry: especially the massive Tang Frères. The street scene outside Tang Frères is always crowded, with shoppers, vendors, diners, beggars, and oglers. There are backyard gardeners selling scallions and cilantro and aunties selling homemade rice balls; the walls are plastered with a babel of advertisements in French, Chinese, Vietnamese, and English; and hungry Parisians line up across the street outside Hoa Nam for bahn mi. But today the crowds exceeded anything I had ever seen before, with thousands of visitors streaming into the quartier to watch the défilé – or Chinese New Year parade. There were so many people in the streets, it was hard to see through the rows of heads to watch the parade stream by. Hearing the parade was no problem, between the pounding of the drums and the sonic booms produced when the dancers lit the strings of fireworks hanging from the trees. Luckily, the dragons danced high above the crowds’ heads, where even those in back could see their colourful silks. It was hard to miss this fearsome yellow lion. It was equally hard to keep from smiling at the fearsome faces made by the little boy inside the mask, although I felt bad for not acting more scared. One of the surprising, and to me lovely, things about the parade was how multiethnic it was. Amidst the countless dragons and incense burners were troops of Carnival dancers who looked like they had taken a wrong turn off St. Charles Avenue. And many of the young dancers and drummers in Chinese silks clearly hailed from places other than Asia. Recently the news has been filled with accounts of vast crowds in Paris gathering to express their intolerance of the nation’s social change; it was nice to witness, instead, a coming together of many different constitutive elements of French society. And, as an outsider, it is fascinating for me to see the differences between the Franco-Asian cultural exchange and the Anglo-Asian cultural exchange. I’ve been curious about the differences since my very first visit to the 13th, when I found myself giggling at an advertisement for Chinese ravioli. Ravioli: that’s absurd. Everyone knows they’re dumplings. 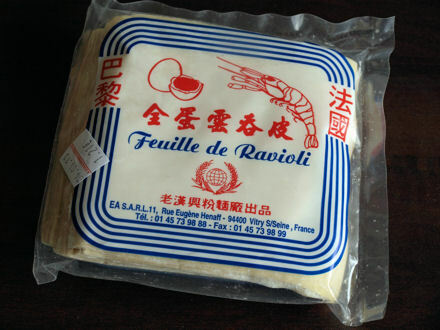 Who has ever heard of such a thing as Chinese ravioli? A moment’s reflection, of course, reminded me that there is nothing more logical about translating har gow or jiaozi to the English word “dumpling” (which apparently dates back to early seventeenth-century Norfolk) than to the Italian ravioli. 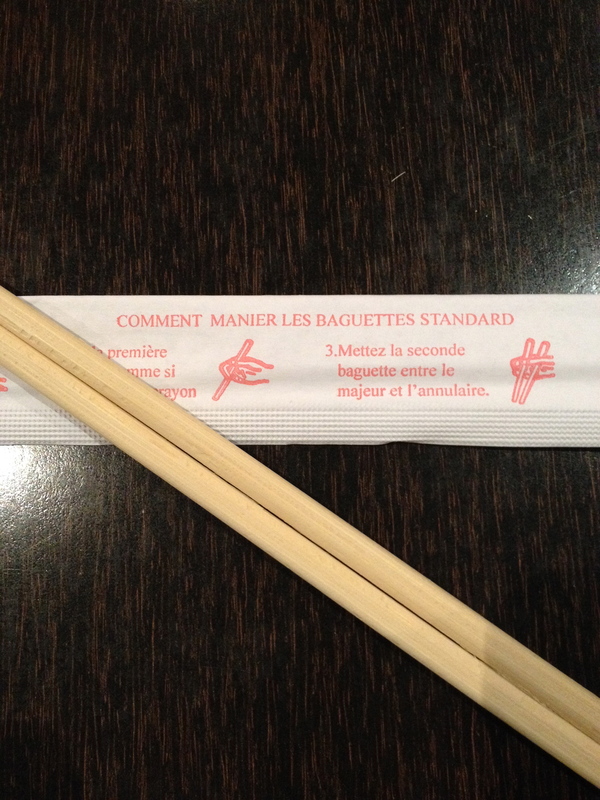 I was also amused on a recent visit to a Vietnamese restaurant to learn that the eating implements known in English as “chopsticks” are translated into French as “baguettes.” Makes sense of course. I think, in this case, the word refers to baguette’s original meaning as a baton or wand, rather than the long skinny bread loaf, which has only been known as such since the 1920s. To confirm that theory I would need to find a nineteenth-century French source that makes reference to chopsticks and see what word was used. Rediscovering Asian cuisine (and culture) through a French lens is an interesting reminder that, much as I like to joke otherwise, this is not my cultural heritage, or rather: my cultural heritage is to have an intimate outsider’s relationship with Chinese food and culture. Is it possible to have a multi-generation outsider-ness be your cultural heritage? Paradoxically, I have never felt more out-of-ease in the French language than when trying to communicate in French in the 13th. My American accent makes my French hard for Vietnamese newcomers-to-France to understand, as their Vietnamese accents make their French hard for me to understand. We meet across a terrain of incomprehension. Even more curiously, when I had a Vietnamese friend visiting back in the summer, he found it almost as challenging to communicate in Vietnamese in the 13th because of the Frenchified vocabulary and accent of the shop keeps. At least all of us – Jews, Vietnamese, French, and every combination heretofore – can meet in amity across a common appetite for that most Franco-Vietnamese of all foods, the bahn mi. But there are at least two other Paris china towns…in the 19th and at Metro Arts et Metier. Try Chez Shen on rue du Maire for great soups at A et M.
You don’t mention any fav restos in the 13th? 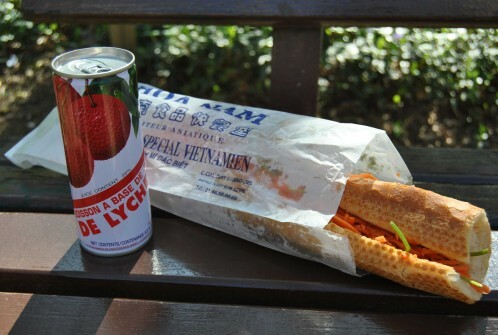 I so love Vietnamese food in France! Especially how they’ve adapted to the 3-course French meal so perfectly and deliciously. 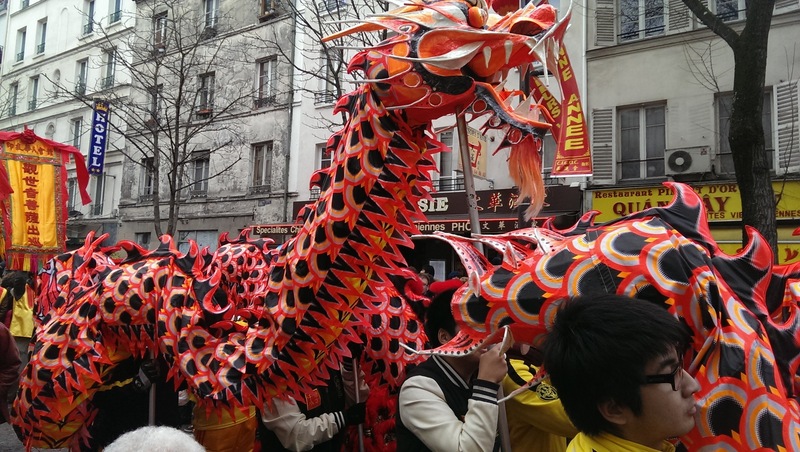 Have had much less luck with the Chinese food in France (understandable given the lack of shared cultural history), but I’d love to experience the Lunar New Year as you did in Paris.